After a short debate about what we should do we removed it with the plier of a swiss army knive which was the only tool available on our small boat (not intended for overnight stays), since we were on the ocean, in a developing country, a few hours away from the coast and several hours away from any vet (probably days from any vet specialised in reptiles, not to mention sea turtles) and x-ray machines. 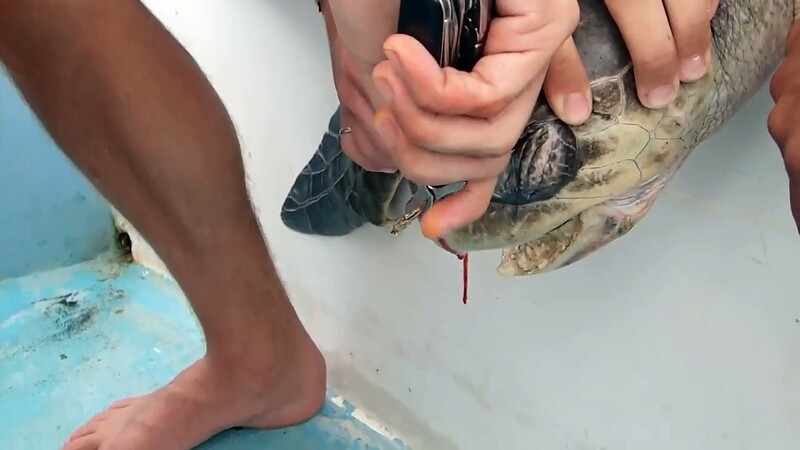 Plus, we would have incured a penalty (up to time in jail) on ourselves by removing the turtle since that is beyond our research permits. He did very obviously not enjoy the procedure very much, but we hope that he is now able to breath more freely. We disinfected the air passageway with iodine and kept the turtle for observation before releasing him back into the wild. The bleeding stopped pretty much immediately after the removal of the straw. The turtle very likely ate the straw and regurgitated the straw where it ended up in the wrong passageway. The nasal cavity of sea turtles is connected directly to the palate (roof of the mouth) by a long nasopharyngeal duct.